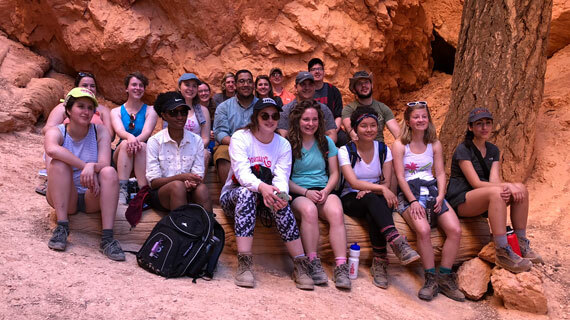 For a third year, the Undergraduate Research and Creative Activity (UReCA) group met in Bryce Canyon, Utah, for a three-day workshop, also referred to as the UReCA Bootcamp. The retreat is a valuable part of the UReCA experience, solidifying the team and setting up the success of the next issue. The team camped, hiked, and spent long hours reviewing and fine tuning UReCA to maintain momentum and improve systems such as soliciting, marketing, Web site design, selection rubrics, and the editorial process. UReCA is a national undergraduate journal of research and creative activity, sponsored by the National Collegiate Honors Council (NCHC). The journal is unique, publishing research as well as creative works, and is 100 percent student-led, from submissions to Web publishing. The editors are selected via a competitive process with representation from all NCHC regions. The journal is physically produced at the University of Tennessee at Chattanooga. UReCA advisers attending the Bootcamp included Brian White of Graceland University, Johnny Maclean of Southern Utah University, and Russell Helms of the University of Tennessee at Chattanooga. Students arrived at the Bootcamp full of questions and on the first day, after getting to know one another, dove right in for their first meeting to discover exactly what UReCA is and to establish a general plan of how to produce the next issue. Students bonded through lively exchanges and excellent camp meals. In addition to camping and brainstorming, students took advantage of beautiful Bryce Canyon, taking a scenic hike on the second day. Each day ended with a group reflection held at the Canyon’s edge. Billy Clouse, a sophomore graphic design major and Associate Editor for UReCA, said that the trip was rewarding on a number of levels. “Camping and hiking with my fellow editors helped us become a close team in a matter of days, allowing us to continue to work together while living across the country,” he said. “I'm also not much of an outdoorsy person, so spending time in the national parks made me feel more connected to the Cedar City area." The students will gather again at National Collegiate Honors Council national conference in Boston (November 7–11) to celebrate the new issue of UReCA, which will go live November 1, and to spread the word for submissions and recruitment of next year’s group. To view the journal visit UReCA website. Submissions are welcome from all currently enrolled undergraduate students. To submit work to the journal, follow the submissions link on the website.